Current antiretroviral therapies (ART) dramatically improve quality of life and survival for HIV patients. Unfortunately, many ART-treated individuals continue to harbor latently infected CD4+ T cells and display low levels of detectable viral RNA, and once ART is withdrawn, the virus rapidly rebounds. These observations highlight the inability of ART treatment alone to eradicate HIV; therefore, new and complementary therapies are needed to detect and eliminate rare populations of ART-resistant, latently infected cells. Julia Sung, Joy Pickeral, Liquin Liu, and colleagues at the University of North Carolina, Duke University, and MacroGenics, Inc., respectively, developed Dual-Affinity-Re-Targeting (DART®) proteins that simultaneously target HIV-infected cells and cytolytic effector T cells and thus facilitate T cell-mediated lysis of HIV-infected cell populations. These HIVxCD3 DARTs consist of two effector arms; an HIV-1 Env-binding domain, which targets HIV-infected cells, and a CD3ε-binding arm, which targets activated T cells. The binding of each arm to its cell-surface antigen brings HIV-infected cells into direct contact with activated T cells, thereby redirecting T cells to engage and kill HIV-infected cells. Critically, in lymphocytes isolated from HIV-infected donors on suppressive ART, HIVxCD3 DARTs promoted clearance of both autologous reservoir-infected CD4+ T cells from seronegative donors and latently infected CD4+ T cells from seropositive patients that had been treated to induce latent virus expression. Collectively, these findings suggest that DARTs should be further explored for the treatment of HIV-1. The accompanying image illustrates the mechanism of action for HIVxCD3 DARTs. The anti-CD3 arm (orange) binds to T-cells, whereas the anti-HIV arm (blue) binds HIV-infected cells, thus directing T cell lysis of HIV-infected cells following target recognition by both DART arms. Citation Information: J Clin Invest. 2015;125(11):4077-4090. https://doi.org/10.1172/JCI82314. Enhancement of HIV-specific immunity is likely required to eliminate latent HIV infection. Here, we have developed an immunotherapeutic modality aimed to improve T cell–mediated clearance of HIV-1–infected cells. Specifically, we employed Dual-Affinity Re-Targeting (DART) proteins, which are bispecific, antibody-based molecules that can bind 2 distinct cell-surface molecules simultaneously. We designed DARTs with a monovalent HIV-1 envelope-binding (Env-binding) arm that was derived from broadly binding, antibody-dependent cellular cytotoxicity–mediating antibodies known to bind to HIV-infected target cells coupled to a monovalent CD3 binding arm designed to engage cytolytic effector T cells (referred to as HIVxCD3 DARTs). Thus, these DARTs redirected polyclonal T cells to specifically engage with and kill Env-expressing cells, including CD4+ T cells infected with different HIV-1 subtypes, thereby obviating the requirement for HIV-specific immunity. Using lymphocytes from patients on suppressive antiretroviral therapy (ART), we demonstrated that DARTs mediate CD8+ T cell clearance of CD4+ T cells that are superinfected with the HIV-1 strain JR-CSF or infected with autologous reservoir viruses isolated from HIV-infected–patient resting CD4+ T cells. Moreover, DARTs mediated CD8+ T cell clearance of HIV from resting CD4+ T cell cultures following induction of latent virus expression. 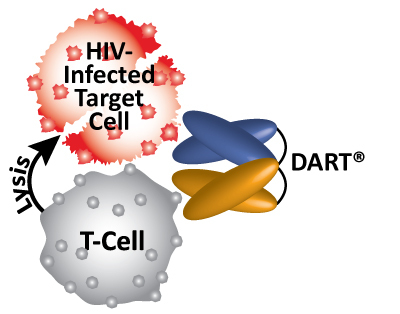 Combined with HIV latency reversing agents, HIVxCD3 DARTs have the potential to be effective immunotherapeutic agents to clear latent HIV-1 reservoirs in HIV-infected individuals.